-Eight (8) indoor ski training sessions in a group setting on the Snow Biste training platform will be awarded. The learn to ski program will include interactive learning sessions, exercise, a presentation to sponsors, and culminate with a group trip to a local ski area. In completing their transformation to skiers, recipients try their news skills on a real mountain. Click this link for the Scholarship form www.snowbiste.com/scholarship. 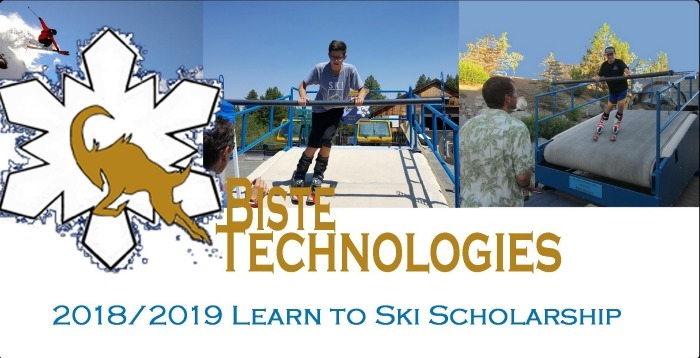 November 18, 2017, Reno, NV — Biste Technologies, LLC, home of the Snow Biste, announced a Learn to Ski Scholarship program for the 2018-2019 ski season for youth ages 11-16. The program is being launched to offer an opportunity for four local athletic youth to learn to ski, who may not otherwise have access to the sport. Scholarship recipients will each be awarded eight indoor lessons on the Snow Biste ski training platform in a group setting. The Learn to Ski Scholarship program will also include interactive learning sessions, an exercise program, a presentation to sponsors, and culminate with a group trip to a local ski area. In completing their transformation to skiers, recipients get to try out their skills on a local ski resort mountain. Interactive learning sessions will be taught and include experience speaking in front of a group, training for healthy sports (attitude, eating and fitness), proper sportsmanship, the local history of skiing and ski racing in the Reno/Tahoe area, and environmental conservation / alpine stewardship. Interested youth athletes can apply for the scholarship online at Snowbiste.com/Scholarship or directly at https://form.jotform.us/72065362440147. The deadline to enter is September 3, 2018. Applicants must fill out a questionnaire to demonstrate their desire to learn, work ethic, sportsmanship, and a willingness to gain the skills to speak in front of a group. Final scholarship announcements will be presented in early October 2018. Indoor lessons will take place November – December and on-mountain lessons are slated for the first half of January 2018. Todd Torvinen, Esq – Todd L. Torvinen Law Chtd. Biste Technologies is a new northern Nevada business that utilizes local resources for all our business requirements. At the core of our business we design indoor snow sport training equipment and we fabricate right here in Reno/Sparks. Our teaching platform, called the Snow Biste (beast), along with our unique training curriculum, the Biste Method, enable teaching of skiing and snowboarding indoors 4 times faster and less expensive than traditional methods. In our first two seasons, we have proved our method as sound and are growing this new Nevada industry. The support from our local ski racing community, snow sport enthusiasts, rehab patients and never-evers has been amazing, so we want to give back to our community as we grow this new local industry. Learn to Ski/Board Foundational sessions are available 7 days a week. Call for appointment. Advanced Ski/Board Training sessions are available 7 days a week. Call for appointment. Mobile Snow Biste machine rental and on-site delivery available. Call for details. All Ski Equipment is provided at no extra charge.